1. Our Privacy window film can offer your the perfect way to help you protect privacy to any space without giving up the beauty of the natural lighting. 2. Using static cling with no adhesives, our window film is easy to handle and install, can be recycled even wrinkled. 3. 99% UV Protected, stop the staffs in door from fading and aging. This window film privacy is thick enough to give the desired privacy and peels off easily. 5. This style of window film is widely used on smooth glass surfaces in the Bathroom, Balcony, Living Room, Bedroom and Office. ✔ANTI-UV WINDOW FILM. High-quality window film can block 99% ultraviolet rays and reduce glares. ✔STATIC CLING WINDOW FILM. No glue, static cling, easy to apply&remove, reusable, can even be used for times. ✔ENERGY SAVING WINDOW FILM. Energy saving film, can keep heat in winter and keep it out in summer. 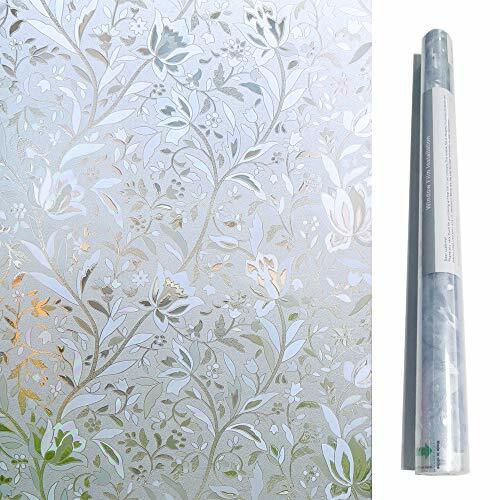 ✔DECORATIVE FLOWER WINDOW FILM. The tulip flowers are beautiful. Can decorate your home with a new look. ✔SIZE: 17.7-by-78.7 Inches (45 x 200cm) in roll. Can Be trimmed or combined to fit any size window. NOTE: Semi-privacy, privacy level: ★★★☆☆ NOT recommended for bathroom use.